With its lightweight design, superb color accuracy and flexible connectivity options, the DellTM M210X Mobile Series Projector offers an ideal solution for road warriors, educational professionals, and others who need to present powerfully while staying on the move. Don’t sacrifice projector essentials just to reduce weight. With the Dell M210X Mobile Series Projector, you get a compact and light business projector that doesn’t skimp on features – or performance. Ultra-Light Portability: At just 2.6 lbs (1.18 kg), the M210X Projector can easily go wherever work takes you. A soft, fashionable carrying case adds convenience during travel, as well as plenty of room for cables and other accessories. Exceptional Brightness & Contrast: 2000 ANSI lumens (max) brightness and high 2100:1 typical (full on/full off) contrast ratio help to ensure that your presentations retain their impact in a wide variety of rooms and ambient-light conditions. Riveting Resolution: XGA (1024x768) native resolution with native 4:3 aspect ratio offers superb quality during data presentations and hi-definition (HD) viewing, with up to 63% more pixels than SVGA (800x600). DLP® & BrilliantColorTM : Equipped with DLP® and BrilliantColorTM technology, the M210X Projector offers impressive picture reliability and an increase in color brightness by up to 50% over DLP projectors without BrilliantColor. From its flexible connectivity options to its versatile usage and setup features, the Dell M210X Mobile Series Projector ensures that control always stays at arm’s reach. Easy Connectivity: The M210X offers multiple connectivity options to enhance multimedia presentations, including VGA , HDMI, S-Video In, and Audio In/Out ports. Closed Captioning: Built-in closed-captioning* capability allows users with hearing disabilities to read the audio portion of select video and TV programs as on-screen text. 3D Capable*: The M210X projector is capable of adapting to 3D, ensuring that you are ready for the next generation of powerful presentations. Big-Picture View: A 302-inch maximum projection size at 39 feet (12m) (projector-to-screen distance) helps to ensure that all your ideas play on a grand stage. Convenient Controls: A full-featured remote control lets you easily perform quick shutdowns, adjust crooked images, change video modes or even hide presentations (via the Blank Screen feature). The Dell M210X Mobile Series Projector offers thoughtful design features and comprehensive support options that make it easy to enjoy a low total cost of ownership. 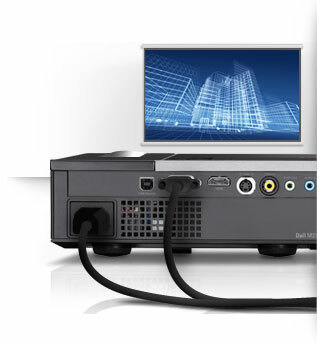 Power-Saving Design: The EuP-compliant Dell M210X Projector consumes less than 1 watt of electricity in standby mode. Long Lamp Life: Enjoy added cost savings with a long lamp life of up to 3000 hours* (Typical-Mode) and 5000 hours* (Eco-Mode). Built-In Security: Password protection and a security-lock slot offer peace of mind when using the M210X Projector in public spaces. Reliable Service & Support: Get back up and running quickly with Dell’s standard 2-Year Limited Hardware Warranty and 2-Year Advanced Exchange Service*. Enjoy added peace of mind with an optional limited hardware warranty extension of up to 5 years, or optional Accidental Damage Service* (U.S. only). Note: Dell M210X is not wall- or ceiling-mountable.